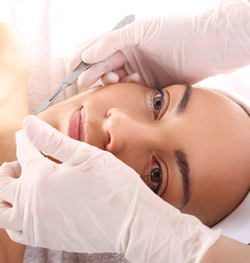 Dermaplaning is a safe and highly effective physical exfoliation procedure. It requires the use of a sterile, surgical scalpel to gently “shave” the skin’s surface, removing the top-most layer of dead skin along with fine, vellus hair (aka peach fuzz). The procedure can be performed monthly, in less than thirty minutes, with no downtime post-treatment.